During the Second World War women were called upon to fill the factory jobs left vacant by men who had enlisted in the armed forces. Their role became vital in ensuring that factories continued to operate and produce goods and materials essential for the war effort. While women were expected to fill positions previously held by men, usually the pay was only about half the wages paid to men. In January 1942 forty women working in the shoe cutting department of Dunlop’s factory at Drummoyne went on strike for equal pay. They were amongst the pioneers of the movement for equal pay for women. The men had been paid £4 19 shillings 6 pence per week while the women were only receiving £2 14 shillings per week, with one junior female receiving just 26 shillings for her week’s work. The strike was ‘settled’ by a lift in wages, however, the women still only received 84 per cent of the male rate of pay. 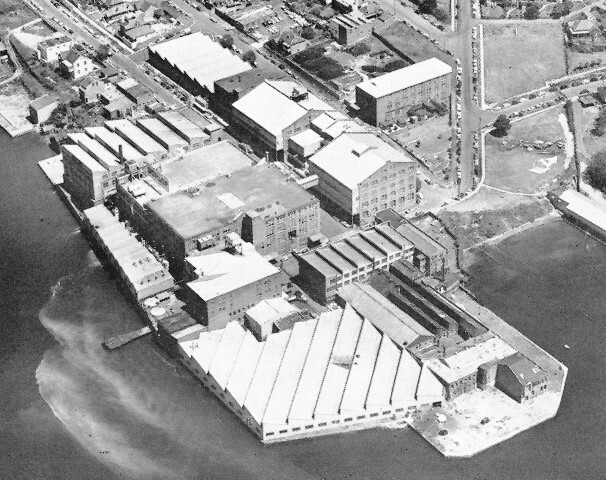 In 1977 Dunlop closed its factory at Birkenhead Point and the site was redeveloped as Birkenhead Point Shopping Centre which opened for trading in 1979. 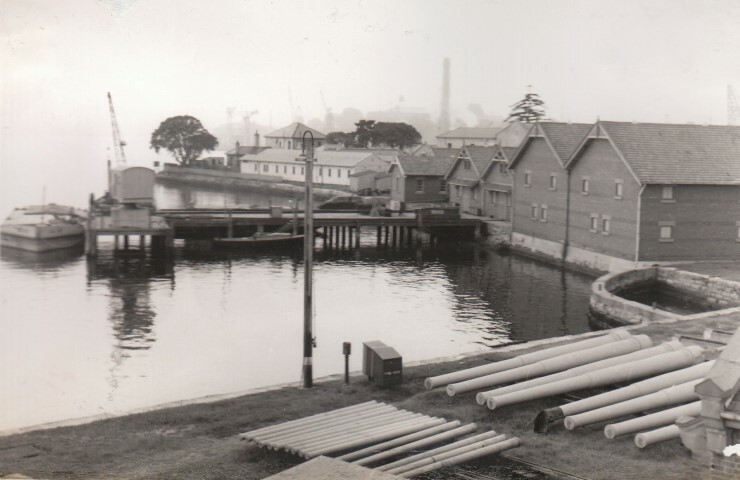 Read more about the story of Dunlop at Birkenhead Point, below, under comments. During the First World War the Australian Comforts Fund co-ordinated the distribution of small gifts to soldiers to make their life a little more pleasant. It was formed in August 1916 and co-ordinated the efforts made by various existing State based patriotic funds. In the field, its activities were overseen by commissioners who held honorary rank as officers. Local Drummoyne Alderman, Mayor and politician, Thomas Henley was one such commissioner who visited Egypt, France and Britain in his work for the Australian Comforts Fund. His own son, Lieutenant Harold Leslie Henley was killed in action on 15 August 1916 in France. 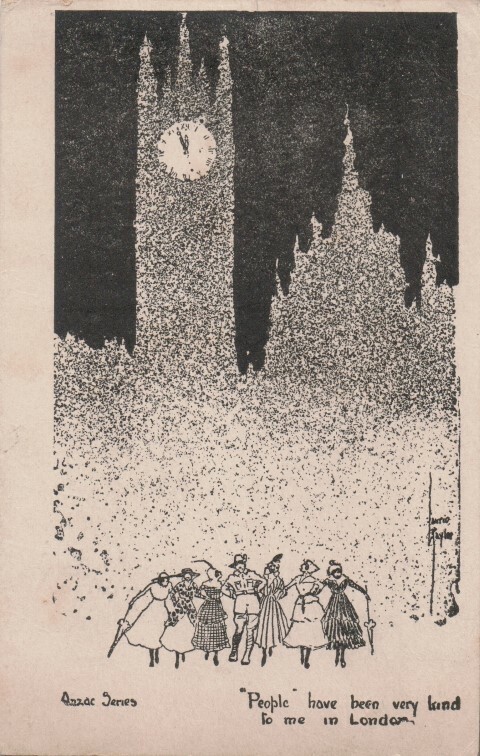 This postcard was distributed to soldiers by the Australian Comforts Fund at Christmas 1916. It was sent by Private Henry George Jeffery to his family in Five Dock. Harry was killed in action on 4 October 1917 in Belgium. The postcard artwork is by Laurie Tayler (Lawrence B. Tayler), an Australian artist and cartoonist of the period. The gentle humour of the postcard (‘People have been very kind to me in London’) belies the horror of the First World War experience. The Drummoyne Amateur Swimming Club has played an important part in the recreational life of our community for over a hundred years. It has had great success in fostering swimming not only at the local level but is associated with some of Australia’s greatest sporting achievements. Its history is studded with the names of famous swimmers and coaches. 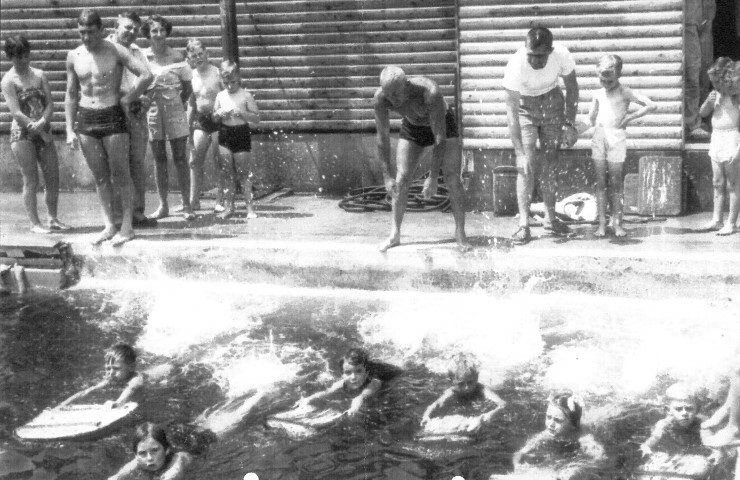 The photograph shows coach Forbes Carlile (wearing a white t-shirt)in the early 1950s coaching young swimmers at Drummoyne Swimming Pool. Past and present members of the Drummoyne Amateur Swimming Club will be coming along to Five Dock Library on Tuesday, 15 November 2016 from 6pm to 8pm to share their memories and stories of the club. The stories will be recorded and added to the library’s oral history collection. Anyone interested in the history of swimming is welcome to come along and share in the club’s rich history of sporting achievement. Throughout the City of Canada Bay there are many memorials, large and small, dedicated to the memory of local men and women who served our country in war. 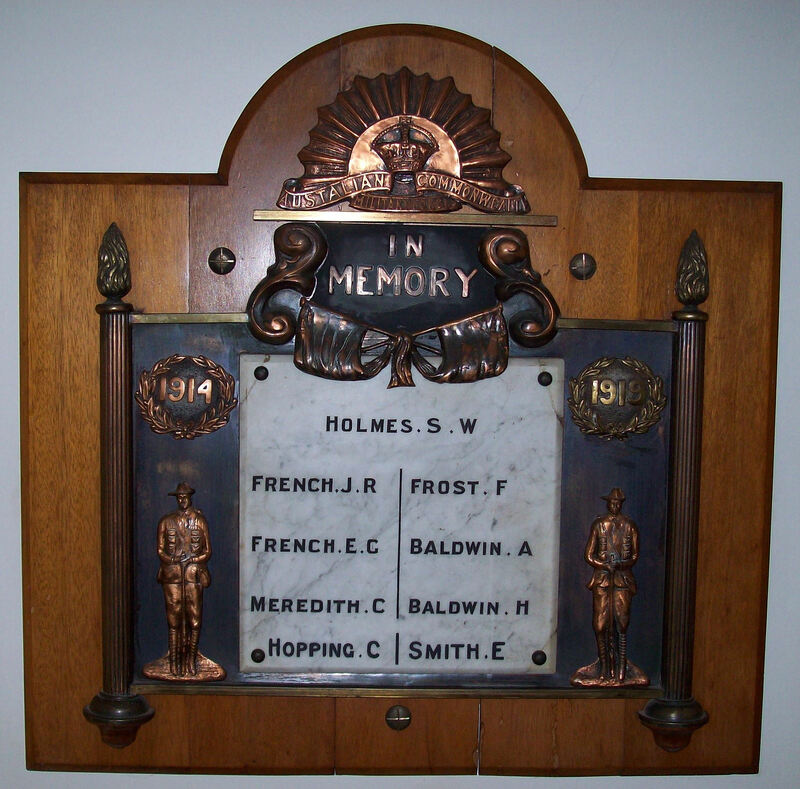 Local Studies is custodian of two memorials to those who served in the First World War, the Drummoyne War Service Record, which records those who served from the Drummoyne area and the Lysaght Bros Roll of Honour, which records the names of workers from the Lysaght factory at Chiswick who served . The beautiful memorial, above, pays tribute to nine soldiers from the Five Dock Methodist Church (now Five Dock Uniting Church) who did not return from the First World War. Undoubtedly it was crafted with love and compassion. Images of some of the war memorials in the City of Canada Bay can be seen on flickr. Over recent months the library has been recording memorabilia held by the City of Canada Bay. Memorabilia such as certificates and trophies provide a record of the activities and achievements of Council and staff. Details and, where possible, images of the memorabilia have been added to the library’s catalogue, making them easily accessible to the community and researchers. 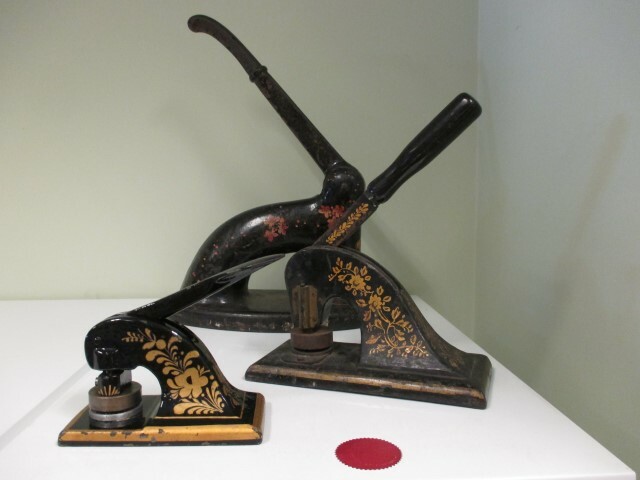 The photograph, above, shows nineteenth century seal presses held in the Local Studies collection. These were used by City of Canada Bay’s predecessor Councils, the Municipality of Concord (rear), Municipal District of Five Dock (centre) and Municipality of Drummoyne (front). A seal press was used to add Council’s seal to official documents. 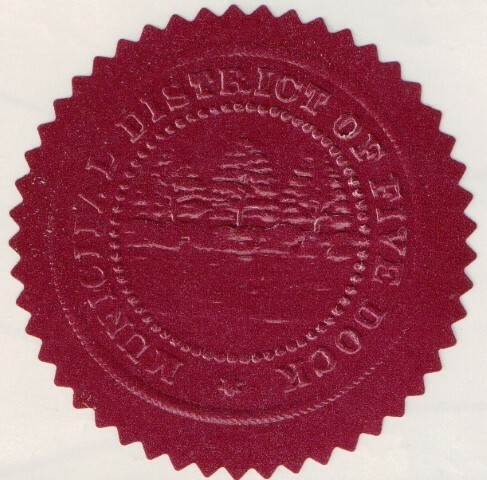 Below is the Municipal District of Five Dock seal which incorporates the ‘five docks’ of Council’s namesake. Five Dock takes its name from an unusual sandstone formation along the Parramatta River near Howley Park which was thought to resemble small docks. Two of the ‘docks’ were later covered by the construction of the first Gladesville Bridge in 1881. Interestingly, the seal also depicts trees which are presumably the same ones that can be seen at Howley Park today. 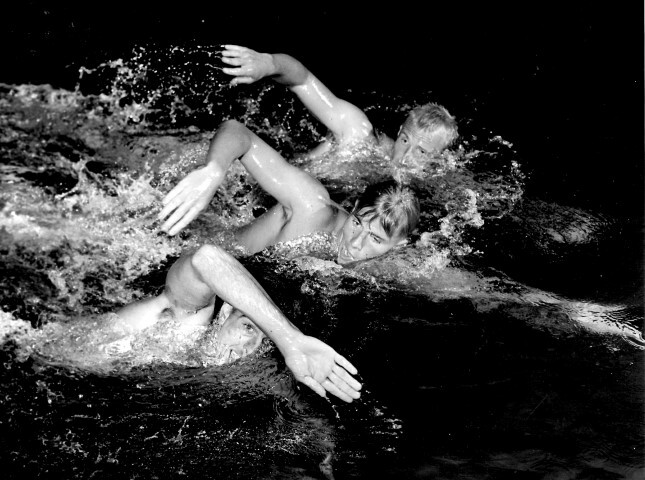 The latest exhibition at Five Dock Library highlights the remarkable achievements of Olympic swimmers associated with the Drummoyne Swimming Pool. Many of the photographs are drawn from the collection of the Drummoyne Amateur Swimming Club which earlier this year entrusted their records to the Local Studies collection for safekeeping. Swimmers include Dawn Fraser, Jon Henricks, John and Ilsa Konrads and Shane Gould along with coaches of the calibre of Harry Gallagher and Forbes Carlile. The photographs include some stunning images taken by noted photographer Ern McQuillan who at one time lived at Abbotsford. Ern grew up in the inner western suburbs of Sydney and began taking photographs as a boy with a box brownie camera. He went on to become a well known photographer for newspapers and magazines. Today his images are held by institutions such as the National Portrait Gallery, National Library and State Library of NSW. The photograph above by Ern McQuillan shows Olympians Jon Henricks, Murray Rose and John Devitt. Another smaller display in Local Studies at Concord Library celebrates local Olympian Lorraine Crapp. Both displays are on view until the end of August 2016. For those who missed seeing the ‘Discover Drummoyne’ display at the City of Canada Bay Museum, the panels are currently on display at Five Dock Library. City of Canada Bay Museum has created a wonderful, informative and comprehensive exhibition exploring life in Drummoyne from early settlement through to recent times. The panels cover the magnificent mansions, booming factories, cultural venues, businesses, schools and famous people of Drummoyne through photographs and stories. 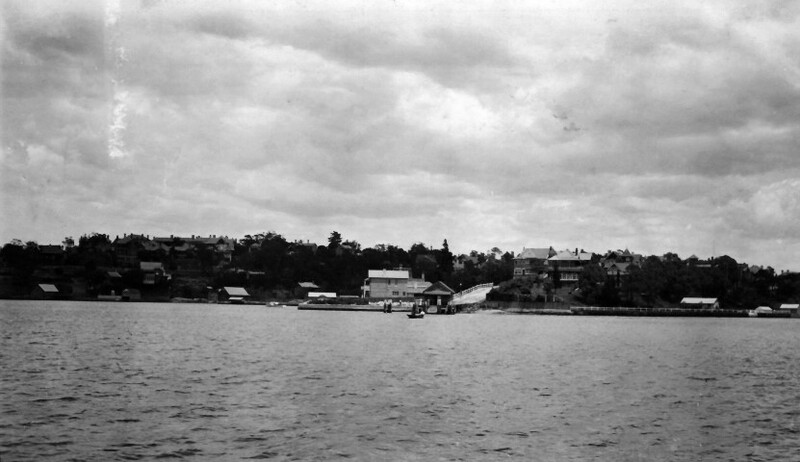 The photograph above shows Drummoyne from Parramatta River in 1911. It is one of a series of photographs held by the City of Canada Bay Museum which have recently been added to the City of Canada Bay Library Service online resource ‘Canada Bay Connections’, the source for many of the images in the display. The display continues until 31 July 2016. For over one hundred years the Drummoyne Amateur Swimming Club has played an important part in the recreational life of our community. The Drummoyne Amateur Swimming Club has had great success in fostering swimming not only at the local level but is associated with some of Australia’s greatest sporting achievements. Its history is studded with the names of famous swimmers, including Olympians Moss Christie, Dawn Fraser, Jon Henricks, John Konrads and Jan Murphy along with coaches of the calibre of Harry Gallagher and Forbes Carlile. The longevity of the club owes much to the dedication of volunteers. During the Second World War sixteen year old Jack Hannaford combined the duties of Secretary and Treasurer when all the men were called up or in reserve forces. Such dedication was also exemplified by Bill Gallie OAM who in 1925 was Australian breaststroke champion. In 1964, aged 54, he moved from Balmain to Drummoyne and was volunteer coach and club secretary for almost twenty years. The Drummoyne Amateur Swimming Club Records recently transferred its historical records and photographs to Local Studies for safekeeping and to ensure that their remarkable history is made available to researchers and the community. A selection of the images will be exhibited later this year at Five Dock Library. 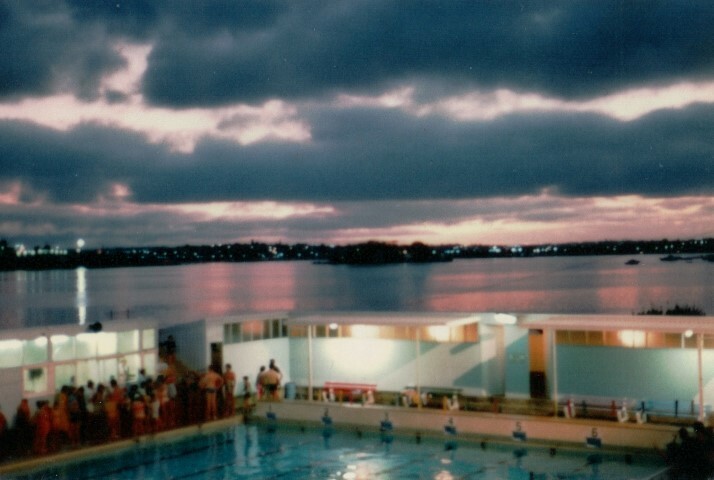 The photograph, above, is of the Club Carnival night in 1981 at Drummoyne Swimming Pool. While brothers from the same family often enlisted in the First World War, it was uncommon to see four brothers do so. At Drummoyne the Erickson brothers, Albert Victor, Roy Robert, Bertie Theodore and George Peter all enlisted to serve. Educated at Drummoyne Public School, the Erickson brothers were keen sportsmen. All four swam with the Drummoyne Amateur Swimming Club, with Bertie (known as ‘Bert’) and George also playing in the Drummoyne Water Polo team. Albert’s other enthusiasm was Australian Rules Football, playing first for Drummoyne he then captained the Western Central team. Bert was also a rower with the Balmain Rowing Club. Albert Victor Erickson, enlisted in August 1915 and served with the 3 Battalion, later transferring to the 45 Battalion. Roy Robert Erickson enlisted in July 1915 and served with the 18 Battalion. Tragically, Albert and Roy were killed in action within a day of one another in the Battle of Pozieres in France. Roy died on 5 August 1916, aged 19 years while Albert died on 6 August 1916, aged 23 years. The photograph of the memorial plaques commemorating Albert Victor and Roy Robert was kindly donated to ‘Canada Bay Connections’ earlier this year by Ian Vinall.